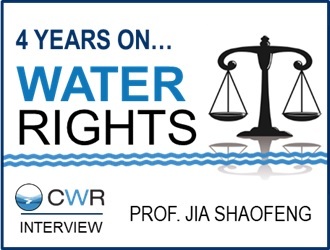 Back in November 2014, Professor Jia Shaofeng shared his thoughts in an interview with China Water Risk on China’s water rights system – what water rights are, who owns them & a market future. Four years later, we caught up with Prof. Jia again to hear about new developments of this system – what are the key challenges and how far they will go. Prof. Jia was also one of the four water experts/ laureates that we had the pleasure of hosting for the launch of our new report “No Water, No Growth – Does Asia have enough water to develop?” and we took this opportunity to ask him for his thoughts on how the week went. China Water Risk (CWR): In 2014, China launched pilot projects in 7 provinces including Gansu, Guangdong, Henan, Hubei, Inner Mongolia, Jiangxi and Ningxia, all of which achieved positive results. Can you expand on some of these successes and the challenges faced ? Professor Jia Shaofeng (JSF): China has made huge progress in implementing its water rights trading system. The establishment of clear water rights and a corresponding trading system are of vital importance in improving water use efficiency. The pilot projects have proved that water rights trading can not only conserve surplus water resources but also resolve scarcity issues in water stressed areas. Moreover, as the 7 provinces have different characteristics, different forms of water rights trading were piloted in each province; therefore creating a wide range of experiences and comprehensive preparations for the future nationwide water rights trading system. There were also a few challenges encountered in the pilot projects. The first challenge was how to establish water rights systems that accounts for geographical differences and this still needs further research. For example, Southern China has abundant water resources and as a result users are less willing to trade water rights. The second challenge is how to establish a proper and flexible water rights trading market. The Ministry of Water Resources (MWR) has set up the China Water Exchange (CWEX), a national water rights trading platform. Based on highly advanced internet technology, the centralised trading platform can be accessed remotely and conveniently. However, due to the specific nature of water rights trading, local governments are still in charge of the review and approval of transactions. Therefore, it may be more flexible if water is traded locally instead of through a centralised platform. CWR: By end of September 2018, a total of 88 transactions involving 2.75 billion cubic metres were recorded on the China Water Exchange (CWEX). Having operated for about 2 years, do you think these numbers reflect the real demands of both sellers and buyers? Does the national water trading platform facilitate market development? JSF: First of all, there is still a fundamental issue of how to define and quantify the real demand from both sellers’ and buyers’ perspectives. The premise of determining actual demand is to first determine the water rights of all parties. In fact, at the moment, except for users with water permits, there is no clear distribution of water rights for micro-level users in most regions of China. Without comprehensive and clear definitions of how much water one is entitled to, it is very hard to determine the amount of water one needs to trade. Besides, as water demand is closely related to water price, only tradeable water rights with affordable prices can reflect real market demands. However, the current trading system is still imperfect due to a lack of flexible pricing mechanisms for water rights. It is difficult for users to measure and understand their own needs without knowing the real value of water rights. Second, it is certain that the current transactions (reflected in the CWEX) are far from the actual demand. The truth is there is still a huge demand for water trading out there; therefore there is a need to improve the water rights trading systems as well as the water market so that we can see the full potential of marketised water resource allocation. Third, there are 2 reasons why the trading market is still underdeveloped: 1) clear water rights distribution is still in process in China; 2) the water rights trading market is still not fully marketised and open: current water rights trading among different regions, river basins, and industries is actually a re-distribution of previous water quotas and internal water rights trading within irrigation zones are still limited to pilot regions. CWR: What are your suggestions for the current system? JSF: The first step is to complete the water rights distribution process. This means allocating water rights into suitable categories i.e. individual users or institutional users (such as town governments, water supply companies, self-supply corporates, irrigation areas, villages, water user associations etc.) Second is to establish region-specific water right trading systems. Third, even though there is a national water rights trading platform, region-specific functions such information sharing, reviewing and clearing should be provided. Perhaps it would be more realistic if those functions are controlled by local authorities. JSF: I am very optimistic. Once the water rights system is further improved, it is sure to greatly increase water-use efficiency and facilitate water conservation in China. CWR: It is certainly great to see water rights trading advancing in China. Besides your expertise in this area, you also provided substantial scientific support and technical assistance in our recently released report “No Water, No Growth – Does Asia have enough water to develop?”. What was the most challenging aspect in completing this report? JSF: As the data provider, the biggest challenge lies in data acquisition as there is still a huge data gap in this topic. The next challenge is to how to present our opinion in a scientific, plain and simple way. CWR: In mid-September, CWR held an Ideas Lab during the launch week for its latest report and you were one of the distinguished guests in the brainstorming sessions. What are your thoughts on the event? Did you find any interesting ideas coming from people with different backgrounds? JSF: It was quite a novel experience for me. It was the first time I attended an NGO-led Ideas Lab that focuses on water issues in a broader scale that stretches from China to the Hindu Kush Himalayas (HKH) region. What’s more, media, investors, industrial researchers and the general public were sequentially invited to discuss the same issues through face-to-face meetings or conference calls. It was so innovative and exciting! And I am so thrilled that so many people are actually interested in this issue. There were some interesting viewpoints arising from the event, like how could investors measure and assess their business risks and what are the concrete steps that one needs to take to solve this problem? Apart from setting the big picture, we still need to do more detailed research to help investors in evaluating the business risks arising from water risks, so that they could use the results in the decision-making process. Some other interesting questions include how China can lead the water-nomics conversations on regional economic cooperation and transboundary issues. Reforming Water Permits in China – European and Chinese water policy experts Martin Griffiths & Chen Dongsheng gives an overview of their collaborative study on water permits systems as part of the China Europe Water Platform. What challenges lie ahead? What improvements are needed?